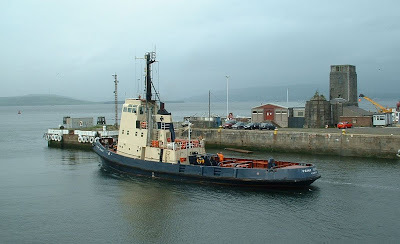 Based at the James watt Dock for a number of years, the tug POINT GILBERT is seen here leaving the dock in May 2004. Built by Richard Dunston at their Hessle shipyard on the Humber, she dated from 1972 and joined the Cory tug fleet when new. Later she served in Canada, and after a major refit in 1988, she was fitted with a retractable Aquamaster azimuthing propulsion unit forward. POINT GILBERT joined the Clyde tug fleet around 2002. After moving to work in other UK ports, she was laid up after suffering from machinery failure. In 2005 she was sold to Belgian owners, and since 2007 has flown the Russian flag, and is now renamed GANGUT.